I’ve had some 10+ hour work days recently, leaving little time for much needed pampering or relaxation. I try not to complain, because I’m a 1099 and very much appreciate the work. I primarily work from home. So today, I was pleased to get a shower in at midday, as I thought it might be closer to dinnertime before I would be able. Hopefully, this is not too much information, but I wouldn’t share all this without a reason. Every day is spa day for me, at least for as long as it takes me to shower. Hubs would be quick to tell you that I take a 20-minute shower. Most days, that’s how I wake up. Some days, that’s how I refresh. Today was one of those days where I needed to do both. My secret weapon that transforms my shower into a spa is something that is surprisingly easy to make…drum roll…bath salts! 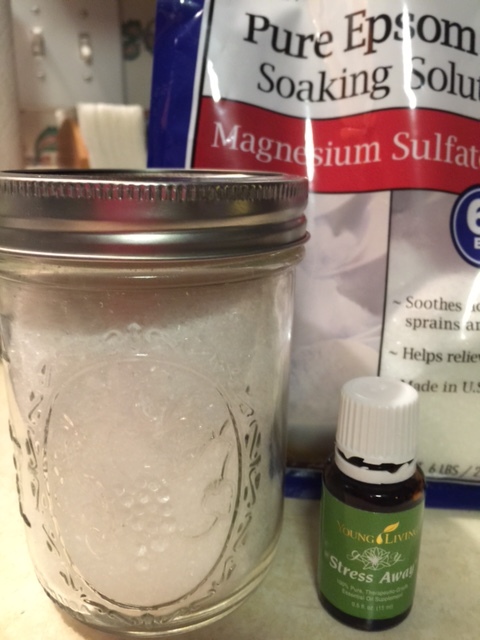 Super easy recipe for bath salts: I pint jar, fill jar with Epsom salts and add 9-12 drops of your favorite essential oils. I usually fill the jar with Epsom salts a third at a time, adding a few drops of essential oils and shaking each time to evenly distribute the oils through the salts. Let set overnight. You might be thinking, bath salts in the shower? I’m not much of a bath girl, but love the benefits of bath salts. Epsom salt is Magnesium Sulfate and can help those with Magnesium deficiencies, and essential oils can be uplifting and refreshing to one’s mood and sense of well-being. I plug the drain in the shower and sprinkle a little of my home brew bath salts on the bottom of the shower and ahh! The Epsom salts and oils are absorbed through my feet and the scent of whichever essential oils I’ve added to the salts drifts up to meet my sleepy nose. My favorite easy essential oil/Epsom salts blend is Young Living’s Stress Away. I frequently make samples of Stress Away bath salts to have on hand for friends. I recycle the 2 oz. baby food jars left over from our diabetic dog’s meals (another story for another day). A 1 pint jar of salts makes almost 6 samples. My favorite combination of essential oils to use with Epsom salts is Peppermint, Lavender and Stress Away – relaxing and refreshing at the same time! So, now you know how to make every day a spa day. I invite you to make your own essential oils bath salts and let me know what combinations you like the most. I’d love to include it in my essential oils recipes book that is ever growing. Until next week, keep bathing or showering, please. 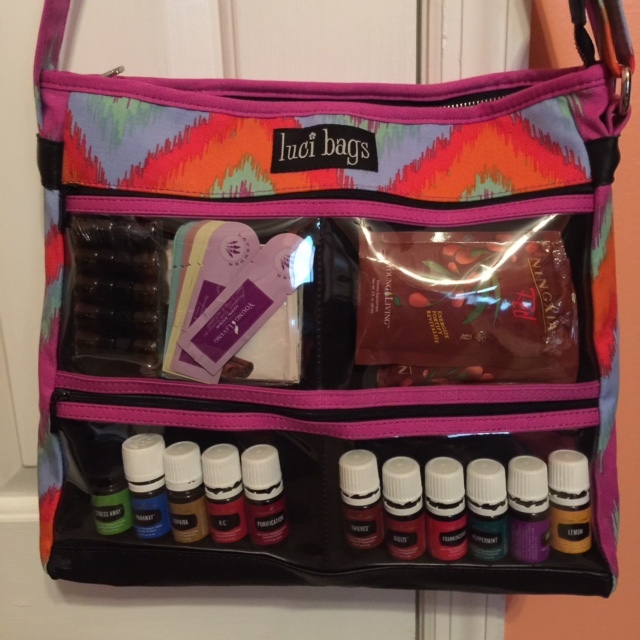 So, I saw this bag I had to have because it’s cute and an easy breezy way to share my passion for essential oils. If you would like to check out other Luci Bag styles, feel free to visit my Luci Bag party. I am not a distributor; in fact, the company has a waiting list of distributors. How crazy is that? I must not be the only one who thinks these bags are the stuff. What is amp? I have Eucalyptus Blue, will that work? I also have Ylang Ylang which I haven’t tried yet. Will definitely try these combos! Thanks! Hi, Therese! My facial regime and recipes are in the “It’s All About That Face” post: https://oilsandspoils.wordpress.com/2015/08/21/its-all-about-that-face/. I’ve been meaning to post an update on a couple of items in the post. I’ve switched from using Purification directly on blemishes to Tea Tree. Tea Tree works great and is less irritating to my skin. I’m also experimenting with charcoal soap and looking to make some in the near future. Bar and lotion soap will be the subject of a post in the very near future. Obsessed! My facial recipes are for oily, blemish-prone skin. Let me know if the recipes are helpful, or if you need some for a different skin type. Thanks so much for your interest and for visiting my blog!